"This might suggest that, during the early middle ages, the territory of present day Poland experienced an influx of groups from what are now Belarus and Ukraine, who then melted into the gene pool of the natives of Polish Iron Age descent. However, conversely, it might mean that Belorussians, Ukrainians and Bulgarians descend in large part from fairly specific medieval groups from the area of modern Poland." The second option seems to be highly unlikely, as it would require a (relatively) massive post-medieval (or late medieval) migration from Poland towards east (Belarus, Ukraine) and south (Bulgaria, and generally Balkans) that was characterized by extreme selectivity towards specific mtDNA haplogroups. No such late “selective” migration is documented in historical records (especially as regards the hypothetical movement from Poland to the Balkan peninsula). Alternatively, one would have to assume a selective extermination of those "Eastern " mtDNAs in a post-medieval Poland, which seems even less likely. And after all, none of those scenarios explains how these “Eastern” mtDNAs arrived to the medieval Great Poland in the first place, as they are supposed to be absent (or much less frequent) there during the earlier Przeworsk period. Thus, we are left with two possibilities only. 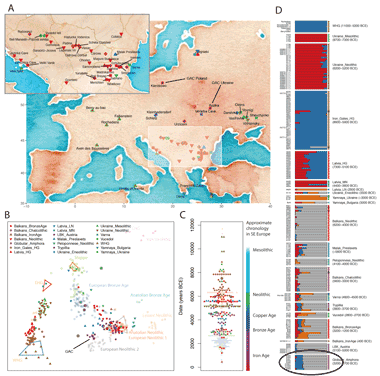 Firstly, there could have been a significant early medieval mtDNA influx from East and/or South that was later followed by another (late medieval, modern?) influx of Przeworsk-like mtDNAs, either from outside (Germany?) or from some internal enclaves (Southern Poland, Pomerania?) that were not tested in this study. Secondly (and most likely in my opinion), the differences recorded in this study are not statistically significant, so they cannot be used to prove or disprove any theory regarding the Slavic ethnogenesis. ^ Like you say, the data doesn't prove or disprove anything about Slavic origins or direction of medieval migrations, due to the small samples. So Poland might indeed be the source of Slavic migrations both to the east and south. But what I found really interesting was the lack of any clear links between the Iron Age Poles and modern Germans, and more importantly, between the Iron Age Poles and ancient Danish samples (for example, no haplogroup I in the ancient Polish mtDNA). 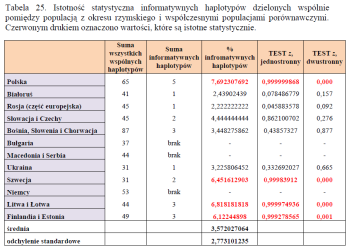 Based on these results, it's really difficult to see Przeworsk as a Germanic culture. As for the relatively high frequencies of haplogroup I in the Iron Age and Medieval Denmark, these values were estimated based on equally small samples. Most importantly, the frequency of this haplogroup among modern Danes is at the same level as in modern Poland (or even slightly lower), which indicates that those aDNA data were most likely not representative for the entire country (not to mention all Germanic tribes), as there were not many post-medieval waves of non-Germanic immigrants coming to Denmark and potentially contributing to such extensive dilution of this putative "Germanic" haplogroup. Also, when you write that "what I found really interesting was the lack of any clear links between the Iron Age Poles and modern Germans", it is hard to imagine how those "special" links should look like, especially when we know that the difference between modern Poles and modern Germans is not statistically significant (even when tested on large samples!). Finally, I find it very strange when you admit that the sample is small and the observed differences are not significant, yet you state that "Based on these results, it's really difficult to see Przeworsk as a Germanic culture". In fact, when you take a look at Fig. 14 in that paper, you will see that the Przeworsk sample is located much closer to the German and Swedish samples than to any Slavic sample (including Polish). Excluding some potentially related individuals from the Przeworsk sample lead to the slightly different outcome (Fig. 15), but even then the Przeworsk sample was located closer to modern Swedes than to modern Poles. I am fully aware that all these differences are not significant, but this is just an example of how an equally biased interpretation (though in another direction) may look like. Please don't get me wrong. I really appreciate your fabulous work on autosomal DNA, but you seem to lose your objectivity as soon as the question of Poland and the origin of Slavs arises. "Special" links between the Iron Age Poles and modern Germans would most likely be seen here as informative haplotype matches between these two groups. But there are no such matches (the table I attached shows zero). As for the MDS, if you look at it closely, it seems that the Iron Age and medieval Poles are nearest to Balkan Slavs. I think the reasons for this are twofold. Firstly, using MDS on broad mtDNA haplogroup frequencies isn't a good way to discriminate at fine scale between closely related North/Central/East European groups. Secondly, it seems that dimension 1 deals with similarity to the German Neolithic LBK sample, and dimension 2 is influenced heavily by diversity, with modern Finns probably showing the lowest diversity, and modern Germans the highest. So this would suggest that Polish mtDNA was more varied in the past, but has since lost some of that variance, most likely due to several major population crashes, like during the Great Northern Wars. Also, I really do think the lack of haplogroup I is important. The samples from ancient Denmark weren't that small, and they produced basically the same results from two burials separated by hundreds of years. I think that if the Iron Age Poles had a close genetic relationship with Iron Age and medieval Danes, then they'd show at least some haplogroup I. "The overall occurrence of haplogroups did not deviate from extant Scandinavians, however, haplogroup I was significantly more frequent among the ancient Danes (average 13%) than among extant Danes and Scandinavians (~2.5%) as well as among other ancient population samples reported. Haplogroup I could therefore have been an ancient Southern Scandinavian type “diluted” by later immigration events." Let's wait for more results, including ancient Y-DNA. Suffice to say, I'm not expecting that I'll be saying anything different to what I said in this blog post when these results come out. I can then conclude from your answer that the fact that none of the 11 “informative” Przeworsk haplotypes was found among 300 modern Germans clearly suggests that Przeworsk could not have been Germanic (though Przeworsk has never been considered as ancestral to modern Germans, even by the strong proponents of its Germanic status, as Germanic does not mean German), while the similar fact that none of those 11 haplotypes was found in 20 Medieval (Polish) samples from the very same region (Great Poland) does not prevent you from writing a post titled “First evidence of genetic continuity in Poland since at least Iron Age”. Do you really feel that this is a fair interpretation of all this data? Let’s go back to your theory that Przeworsk (or Pre-Medieval Poland) was a source of the Slavic expansion towards east and south, although the mtDNA data clearly suggest that it was the other way around (i.e. 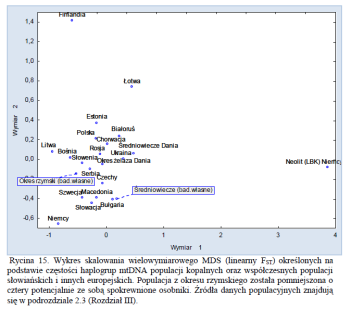 Poland was rather a target of the mtDNA influx from the East and/or South). How would you explain the fact that the Medieval mtDNA sample form Poland shows clear association with modern Belarus, Ukraine and Bulgaria, while no such association is found for the Iron Age (i.e. Przeworsk) sample? In fact, the Przeworsk sample shows statistically significant difference when compared with modern Ukraine and Belarus, while no such difference is observed when comparing Przeworsk with modern Germany and Sweden, or with the Iron Age and Medieval Denmark. The only sensible interpretation of this result is that Przeworsk had nothing to do with the Slavic expansion, while Early Medieval Poland (or at least Great Poland) was an obvious target of this expansion. When discussing the importance of haplogroup I as a putative Germanic “marker”, you avoid to answer my major objection, mainly that the frequency of haplogroup I in modern Denmark, Sweden and Germany does not exceed the frequency of this haplogroup in Poland, while it reaches its peak among Carpathian Lemkos and on the Krk island in Croatia (11% in both cases). How would you explain the fact that this “Germanic marker” shows no correlation with Germanic-speaking populations. The explanation provided by the citation from the original paper (Melchior et al.) is not satisfactory, as there are no records of any post-medieval immigrants who would be responsible for the nation-wide decrease of the haplogroup frequency by the factor of six. Actually, I have just read this paper, which only confirmed my initial suspicions that the ancient sample was not representative for the whole country. All these Iron Age and Medieval samples were taken from the relatively small region of Denmark (two islands only, Zealand and Funen), with six haplogroup I samples found on Zealand and one on the nearby island of Funen. There were no samples from Jutland, which constitutes the major part of the country. Importantly, it is the Northern Jutland region that shows some clear association with Przeworsk according to many archeologists. Yes, I think the lack of informative haplotype matches between the Iron Age Poles and modern Germans is very important. It's also important that the Iron Age Poles show the highest number of informative haplotype matches with modern Poles. So at the moment, I believe these Iron Age Poles played a part in the ethnogenesis of West Slavs in what is now Poland. The medieval mtDNA results make me think that there was an intrusive element from the immediate east in Poland at that time, living alongside the direct descendants of the Polish Iron Age. These two groups probably eventually mixed, creating the modern Polish gene pool. Although the problem with that scenario, is that there's a lack of the East Slavic R1a clade in Poland. So ancient Y-DNA from Poland is sorely needed at this point. As for the other stuff, like the haplogroup I, the scientists thought it was worth mentioning, so I mentioned it as well. Obviously, these people aren't total morons, so when they see something of note, we should consider it as well. "I won't be surprised if it looks fairly typical of modern Poles, and includes R1a1a-M458, which is the most common Y-chromosome haplogroup in Poland today." Iron Age Denmark closer to Poland by DNA than Iron age Poland is to Poland!? Is this perhaps evidence of the Lechitic Slavic Polabians being the inhabitants of Denmark into the Iron age!? As I am sure you know.... Polabians were Lechitic Slavs & thus like a Western Polish tribe in the area of North-Germany - Denmark border region. But... I mean this DNA evidence seems to in my eyes support that Polabians were inhabitants of Denmark during the Iron age! ......... As for the Iron age map of Germany. It looks like Poland & Germany are closer in the Modern era than in the Iron age! This makes sense though giving how much during the Medieval era that Germans have mixed with West Slavs & a bit of German mixture in West Slavs. I mean... I heard that 15% - 25% of Germans have Slavic orgins surnames. So... I mean German mixture with Slavs is certainly a statistical number. But... If Poland & Germany have gotten closer by DNA since the Iron age. It seems to support that Poland & German were even further separate entities before the Iron age. I suspect Germany was a Celtic Isolate at the time!? Perhaps!? But.... It all seems to support that Slavs are the original inhabitants of Poland!!! That even Polabians are the original inhabitants of Denmark! Another Question you should be asking yourself if Poland was a German territory then the Slavs moved in, then why is their so little Germanic Dna in Lithuania and vise versa? Surely they would have intermingled? It looks like German Dna followed only during the well documented land grabs. So it's difficult to imagine that the ancient Wielbark and Przeworsk people who once lived in Poland were Germanic. Germans by and large have origins in other parts of Europe, further to the south and west, and are more Middle Eastern genetically. But many Germans also do have Slavic admixture, and those from the former Eastern Prussia might have some Baltic Prussian ancestry. By the way, no I don't think Huns and Avars were Slavs. They were most likely Turks, but they didn't leave much of a trace in Europe. You could be right,but realistically you need large numbers of men and women to service an army (or the locals would beat you back with sharp sticks) therefore you would think eventually they would leave a trace like the moors of Spain or the Saxon's in Britain. as wild barbarian tribes invading Eastern Europe? Slavs weren't in perpetual conflict with Avars and Huns. Often they worked together because they were attacking and oppressing the same targets and not each other. It seems there are many false cliches in the west about Eastern European prehistory and history, and it'll take years, if not decades, to put them to bed with ancient DNA and more advanced archeological work. I was merely suggesting that because of the lack of Central Asian haplogroups (often suggested by historians as the homelands of avars and huns) and the similar movement's of the slav,ante, avar and Hun suggests that in fact they could have been one and the same. Of course further research will dispel any ambiguities and help better understanding of eastern- europe which has be woefully neglected by scholars. Can you give us any information when Y DNA will be tested from the ancient sites. Not sure about any useful papers on Slovaks, but they're very similar to both Czechs and Poles. They're basically like a cross between Hungarians and Poles. But modern Hungarians are almost totally of West Slavic and German ancestry, so that doesn't mean Slovaks are part Ugric or anything. Here is a PCA plot with Slovaks and Poles. I've also run other tests with these Slovak samples, like here.